That's put the kiss of death on our hopes then! Our play-off final game will be played on the 26th May. I don't know the kick-off time. Working backwards the semi final dates are likely to be during the period from 9th (last league game 4th) to 16th May leaving at least 10 days for the finalists to prepare. 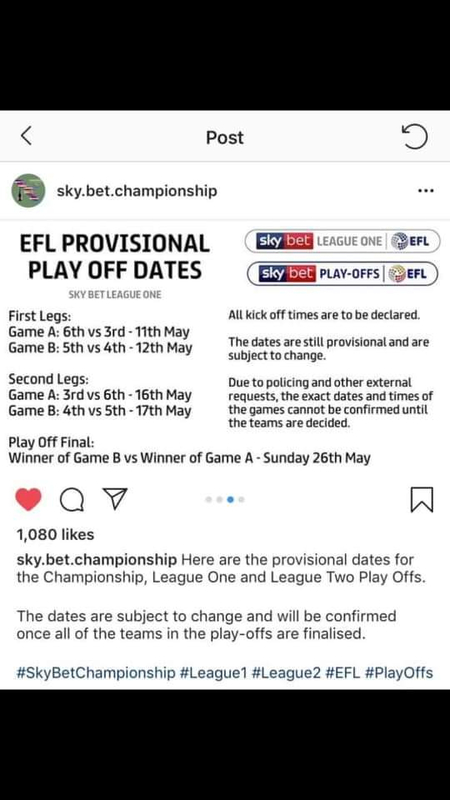 Working backwards the semi final dates are likely to be during the period from 9th (last league fans 4th) to 16th May leaving at least 10 days for the finalists to prepare. I’m away on those dates so we are definitely going up automatically. I’m stuck on a ship in the middle of the Med on final day so unfortunately I won’t be there. Classic f*** up with the sale of tickets awaits. Don't worry......you're boycotting games in any case. If the games are played on the same days as previously, first semi final will be on Thursday 9 May and second leg on Sunday 12 May. Second semi final will be on Saturday 11 May and second leg Wednesday 15 May. How many tickets would we get/sell if we are in the final? Do we normally have to wait until the end of the season 'til they tell us the dates of the Semis? Seen on Facebook. Not sure how reliable this is though. So 5th vs 4th first leg is Sunday, second game is the following Friday? where did you get your name from?!!!! !